The brain is often described as divided into three parts: the “reptilian brain” that controls instincts, the “limbic system” that controls emotions, and the neocortex that controls rational thought. The classic view is that rational thought of the neocortex controls the “lower” reptilian and emotional brains. 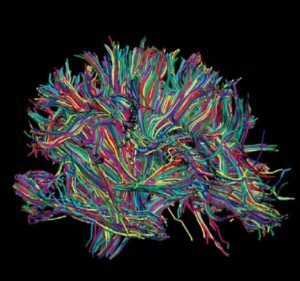 Currently neuroscientists think of the brain as a dynamic network of multi-directional connections. This newer view encompasses the understanding that many parts of the brain are interconnected and do not neatly separate emotions from so-called “rational” thought. Neuroscientists have measured the speed at which these many connections conduct data. To their surprise, researchers found that more creative people and people more open to new information often have slower nerve connections than less creative and less open people. This research suggests that we need to slow down our thinking to think more creatively and to take in new information. When creative solutions are needed in a mediation, mediators need to slow down the process and give participants time to come up with solutions. Fast-moving brainstorming sessions are less likely to produce new ideas than slower more deliberate discussions that give everyone more time to consider the problem. Another consequence of the interconnections of the brain is that emotions can rarely be walled off from what we like to consider “rational” decision-making. Human brains connect the emotional areas like the amygdala with the neocortex which mediates decision-making. We cannot separate these areas. Higher cortisol levels also make it more likely that ideas will become entrenched and less likely that problems can be seen from different perspectives. High emotions cause higher cortisol levels and these higher cortisol levels increase the perception of anger in others. Mediators can slow the process down to allow cortisol levels to diminish before moving from information gathering to option generating phases of mediation. They should use caucus to give both sides time after strong emotional encounters. Mediators can discuss emotional issues with participants and try to get the participant to name their own emotion as this is the most effective strategy to try to reduce strong emotions. Mediators can suggest that participants write about their emotional reactions while the mediator speaks with the other side. This kind of journaling decreases high emotions.